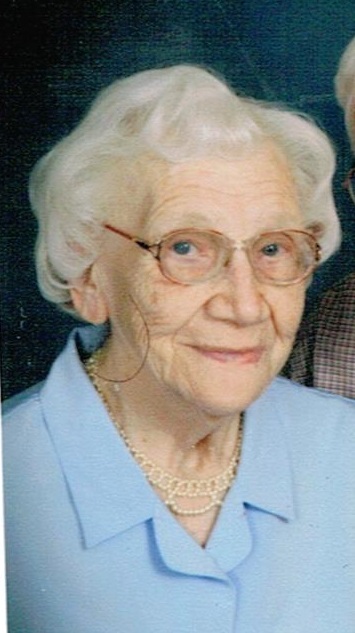 Marjorie "Marge" Johnson, 90, passed away January 11, 2015 at Avera McKennan Hospital in Sioux Falls. She was born on May 1, 1924 in West Point, IA to August and Minnie (Lohman) Pollpeter. Marge was united in marriage to Harold Johnson on October 5, 1946. They lived their lives in Sioux Falls where they raised their children. She was a proud homemaker. Marge and Harold were charter members of St. Michael Parish. She attended the building meetings of St. Michael and was very involved with the planning of the design for the kitchen. Throughout her parish activities, she made many friends. She planned and served funeral luncheons for numerous years. She was a long standing member with the Catholic Daughters of the Americas and was very active with the St. Vincent DePaul Society. Marge was a self-taught seamstress. She made wonderful wedding dresses and baptismal garments. She was a very strong person and raised her children with a strict and strong sense of pride. Marge is survived by her children: Janet (Jim) King, Apple Valley, MN, June (Steve) Mahr, Olympia, WA, Janelle (Leon) White, Farmington, MN, John (Jeanne) Burrows-Johnson, Tucson, AZ, Melvin (Ida) Johnson, Apple Valley, MN and Mark (Shelley) Johnson, Sioux Falls, SD, and 7 grandchildren and 3 great-grandchildren. She was preceded in death by her husband, Harold and one grandson. Donations may be made to St. Michael School. Visitation will be Thursday, 5 PM at Barnett-Lewis Funeral Home with a Scripture Vigil at 7 PM followed by a Catholic Daughter of the Americas Rosary. Mass of Christian Burial will be Friday, 10:30 AM at St. Michael Parish.